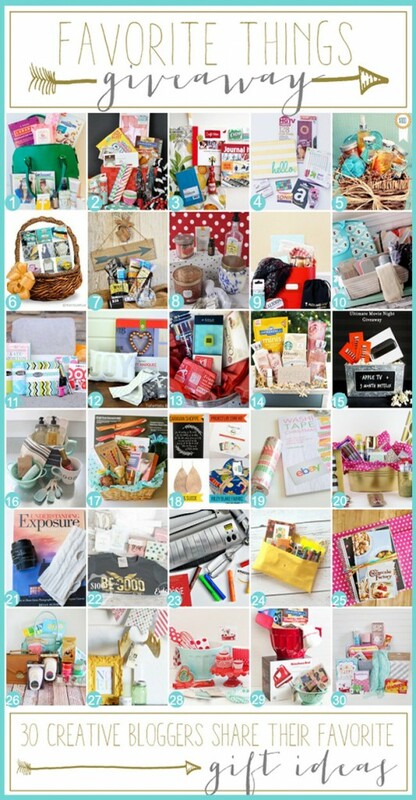 This annual Favorite Things giveaway is my very favorite of the whole year. 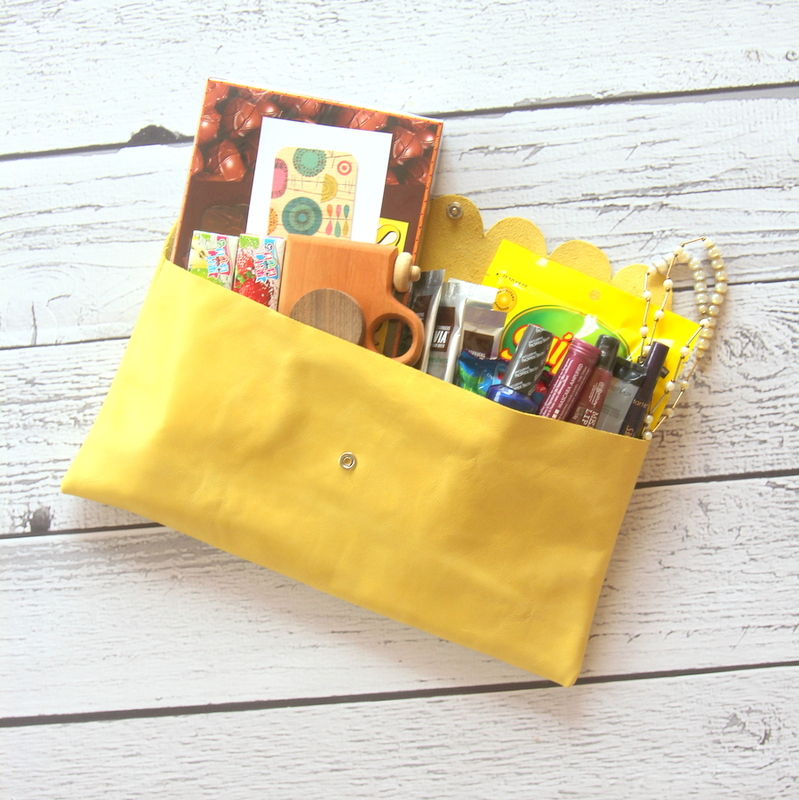 I love gathering my favorite things and putting them in a fun package (well, in this case, a fabulous leather clutch that I whipped up) for one of you! 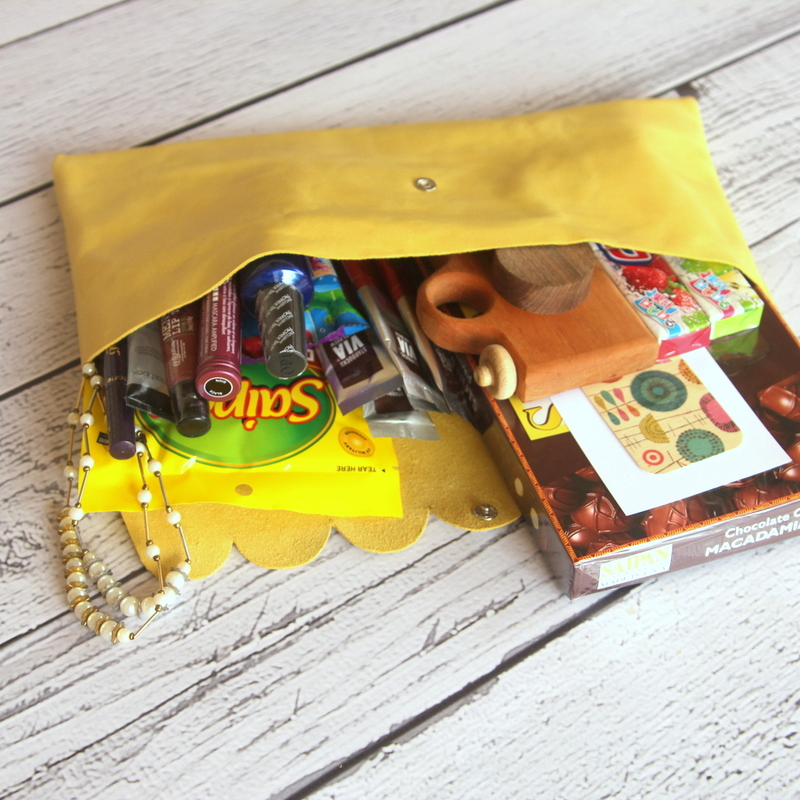 Also, I love hopping around and checking out the other blogger’s giveaways- I always get such great stocking stuffer ideas. Plus, this giveaway every year is the day I start to my Christmas list. Like I said, I love it! I love (LOVE!) this year’s collection of favorite things (I mean, of course I do, but maybe I should say it again for emphasis- I lo-ove this stuff). 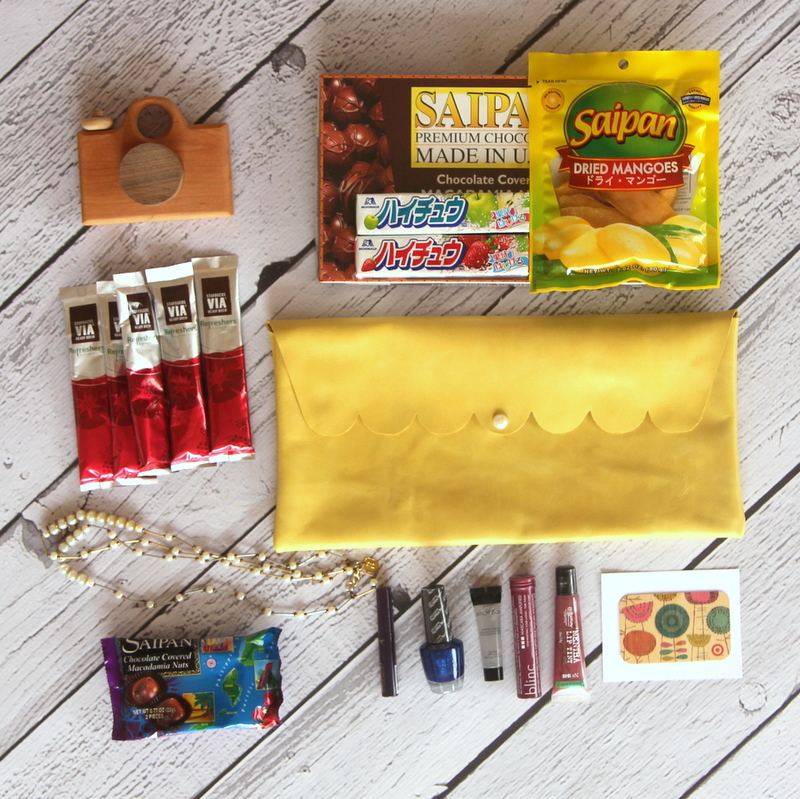 This year’s round up is a mixture of my very favorites from home and my new favorites from Saipan, all bundled into a handmade-by-kojo leather clutch- I can’t wait to send this to one of you! SimpleGreat wooden toy camera– This handmade wooden toy camera from my insanely talented brother-in-law’s shoppe can be used as a toy or as decor (I had one in my office/craft room in Denver!). Love. Bath & Body Works Mentha Lip Tint– I lovelovelove this minty lip gloss. I may or may not have brought seven or eight extras to Saipan because I can’t imagine running out. $25 Target gift card– Out of all of the stores I miss, I miss Target the most. 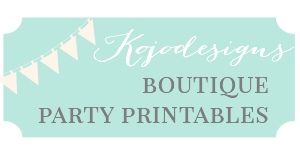 Think of me while you peruse the latest Oh Joy! collection, ok? OPI nail polish– Did you know that I almost always have my finger nails painted? Except when I get super nervous and bite them all off. Anyhow, I love OPI nail polish, and one of my favorite colors in navy blue, so this little navy blue OPI is a double winner. Starbucks Via Very Berry Refreshers– I loved Starbucks Via before we moved to the land of no Starbucks (I even gave some away in my favorite things bundle last year! ), but I lo-ove them even more now on my Starbucks-lacking-tropical-island. So yummy and refreshing! Anthropologie Dot Dot Dash necklace– Classic and fabulous. Blinc and Tarte mascaras- A favorite things giveaway just wouldn’t be complete without having the chance to share some of my favorite mascaras with y’all. 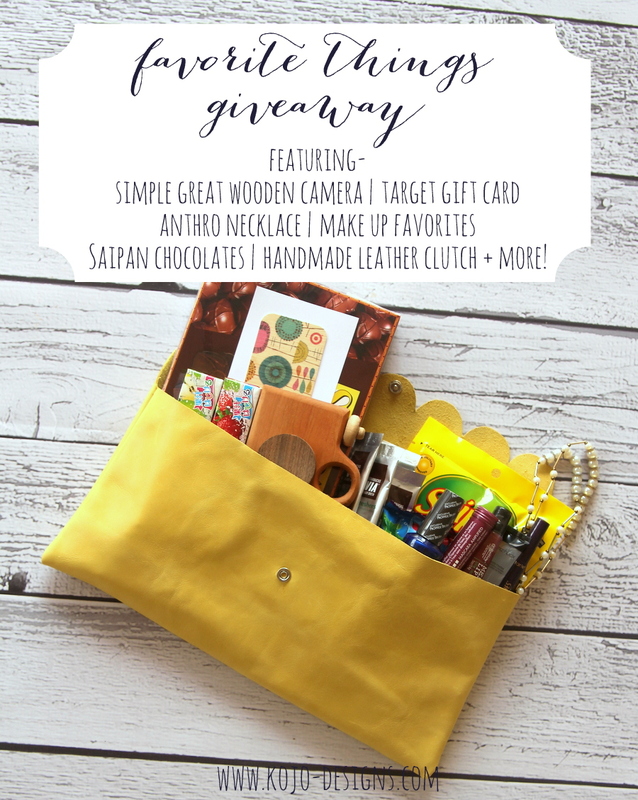 Part of the reason that mascara always makes its way into this giveaway is because I just love trying new mascaras. This year’s winners? Blinc and Tarte Lights Camera Lashes. Even better, one is water resistant and the other isn’t. A girl needs options, am I right? Smashbox Photo Finish Foundation Primer (0.25 oz)- Another repeat from previous year’s favorite things giveaways, and yet I couldn’t not include it. This primer is the perfect makeup base, helps keep your makeup in place, and lets you use less makeup. Favorite thing for sure. Saipan goodies- A little collection of yummies from our new home- Saipan mangoes, chocolate covered macadamia nuts, and even some Japanese candies (we’ve been loving trying all of the Asian treats at our local markets, so I thought I’d include some for you as well!). Delicious all around! *Winner outside of the US will have to pay shipping over $10. Kera, I was trying to make sure it’d fit an iPad at least. 😉 But all of those extra favorite things are nice fillers as well, right? I think there is an error in your script. All the others are still accepting entries for the next 4 days. Thanks Kristi! Tutorial in the works (it should be up early next week)!